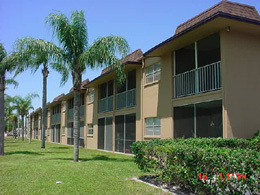 ST. PETERSBURG, Florida- Bison Financial Group, a real estate advisory firm based here, announces the closing of a $2,100,000 loan to refinance a garden style apartment property located in St. Petersburg, Florida. Bison arranged the acquisition financing on the property three years ago. Bison was called in to negotiate a loan refinance with the existing lender to get its client some cash out at a fixed rate and to save on closing costs by not having to start all over again with third party reports with a new lender. Bison represented the borrower, a Sarasota based investor. “When the call came from our client to get started on the refinance, we looked at every angle to get them a longer term, fixed rate loan”, said Jared Repka, one of the principals of Bison. “In the end it made the most sense to work with the existing lender with whom we have a great relationship with to try to work out a good deal for all.” The non-recourse, assumable loan was structured as a 5-year term with a fixed interest rate of 6.25%.